Editor’s Note: This communique speaks to the recent scheduling of the final hearing in the case of anarchist political prisoner Miguel Peralta Betanzos. Following the pattern of irregularities in the case, the court again broke their own laws, scheduling the final hearing in two months rather than within five days as the law states. 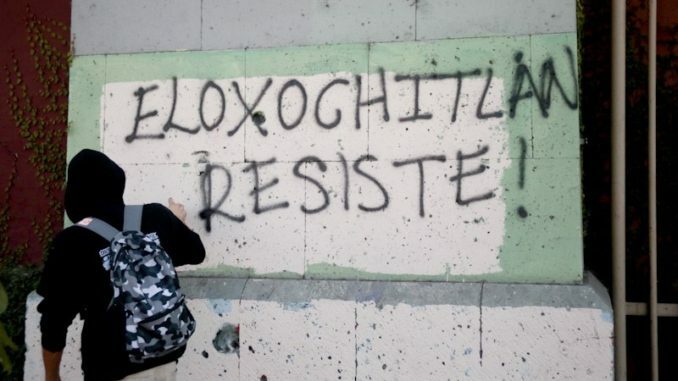 This repeats the ongoing strategy of the court to maintain Miguel Peralta Betanzos and the other imprisoned compañeros of Eloxochitlán de Flores Magón, Oaxaca in prison without a conviction. Originally published by Voices in Movement. Collectives, individuals in solidarity, families and free media projects that responded to our call-out for letters directed to the judge Juan León Montiel: Doubt not that our demand for freedom will resonate in that court that boasts of being a representative of the blindfolded women of justice. A harmful symbol of submission, where the scale weighs much more on the side of blindness. Thanks to the presence of you all, adding to the work done by Los Otros Abogadoz, after various excuses, the final hearing was officially scheduled. However, the court clerk, Alejandro Escobar, with the judge being absent on vacation, decided again to break his own court’s laws. In spite of the code of criminal procedures stating in article 458, that the day in which the defense presents their conclusions of innocence (July 9th in this case), the final hearing must be scheduled within the following five days, it was decided this July 27th, to schedule the hearing for September 28th. That is to say in more than two months. Five days converted into sixty-four days. Sixty-four more days so that the judge can begin the supposed study of the six volumes that make up the file and dictate the sentence. Sixty-four days that prolong again, without reason, the incarceration of Miguel. But also, it is sixty-four days that we will not back down, as they wish. We will not tire showing our courage and dissent against their ways of balancing the scales of justice. We turn to you all to recharge our strength and to act. Let’s not stop demanding the immediate freedom of our compañeros from those dungeons where they remain imprisoned. Just like those at the court, we can break their codes, their laws. To disobey is something we know well. Let’s shout in every which way possible and come up with other ways until we see them free. So that our anti-carceral heart does not stop beating.